Ashford Castle's owner have secured a High Court injunction preventing those protesting over the closing off of an alleged right of way on the estate from blocking entrances and causing disruption around the five star luxury hotel. 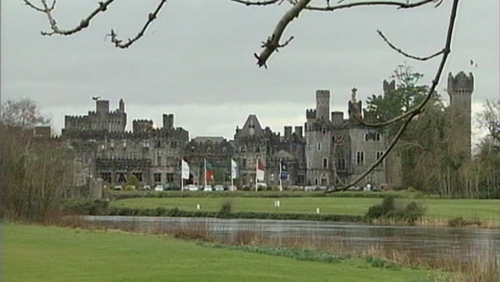 The court heard that a local community group has organised a protest over what it claims has been Ashford Castle's decision to extinguish a public right of way through the estate this evening. Lawyers for the hotel and estate told the High Court that there was a real danger the protesters would block the estate's entrances, roadways and bridges causing severe disruption to guests, staff and patrons of the hotel. Mr Justice Patrick McCarthy granted Ashford Castle Estate Ltd and Ashford Castle Properties Ltd a temporary injunction against Hugh Lavelle, Cong, Co Mayo, and Sile Gibbons, Quiet Man Cafe, Main Street, Cong, who the court heard are the respective Chairperson and Secretary of Cong Community Council. The injunctions prohibit the defendants, and any other persons aware of the orders, from obstructing the entrance, roadways and bridges at the Ashford Castle Estate. The orders also prevent the same parties from interfering, obstructing the movement of persons accessing, exiting or moving within the confines of the estate. The orders were granted on an ex-parte basis (one side only) and were made returnable to early next week. James Dwyer SC, appearing with John Kiely BL for Ashford Castle, said the dispute arose out of a decision taken during the Quiet Man Festival in August. During that event, in order to protect guests and patrons at the hotel, management at Ashford Castle restricted traffic, as well as closed and manned a number of gates on the estate. Gates near the estate's helipad have remained closed since 30 August, although no person has been refused access through the gates, counsel said. The following day a group of people including members of the community council held an hour-long protest against the gates' closure. Counsel said the group consisted of 30 people and 12 cars blocked a bridge close to the gates near the helipad. This counsel said it "caused great inconvenience to guests and staff at the Hotel, some of whom were attempting to make flights at Shannon Airport”. The gardaí were called and the protesters agreed to move on. The owners of Ashford Castle later received a letter from the community council objecting to the closure of the gates near the helipad, which they claim is an obstruction "to the public right of way to the people of Ashford village and the community at large". The letter said the community council would take action to maintain the right of way. Mr Dwyer said the community council have not issued legal proceedings to establish their claim.